Like many of you, I remember this day more vividly than almost any other day in my life. I was an idealistic young college student, the world at my finger tips. I thought I was invincible. I was in my own little world, the center of my universe, when the attacks took place. But it wouldn’t be long before my invincible egocentric world would be rocked to the core and I would be forever changed. 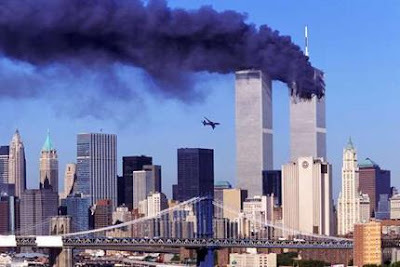 I heard screaming, “We are being attacked, the World Trade Centers are being attacked!” I ran with the others to the nearest tv and saw the images that will forever be burned into my mind. Images of war and bloodshed and utter terror. Shock, tears, anger, and a desparate need to feel connected with the other students gathered were the emotions running through me as I helplessly watched my great country burn. Our small group clung to each other and did the only thing we could, we prayed. We prayed for those in the flames and we prayed for those who were fighting them. And every September 11, I remember with a shudder that I am not invincible and our country is not invincible. But despite those thoughts I take comfort knowing that in the end “we will not tire, we will not falter, and we will not fail.” God Bless America. This entry was posted on Friday, September 11th, 2009 at 5:57 am and is filed under Uncategorized. You can follow any responses to this entry through the RSS 2.0 feed. You can leave a response, or trackback from your own site. On September 11, 2001, I was walking into senior Honors English when I noticed several students gathered in front of the TV in our classroom. We sat silent in class for what seemed like hours. Everything was in slow motion. I don’t remember much about that day. I just remember an eerie feeling which seemed to envelop the entire nation as we watched the tragedy of the day unfold. I was young and naïve. Did that really just happen? HOW could this happen? Whose asses are we going to kick? We like to think we’re 10 feet tall and bulletproof. Invincible. The sheer magnitude of what happened within such a short period of time is completely indescribable. In those early moments of live coverage, I knew the face of our nation, and the world I was about to step into had altered the face of America and American lives forever. The sense of invasion that came along with the attacks was enough to knock me on my knees. I remember thinking, “Where do we go from here? What does tomorrow look like?” My father ran into burning buildings for 20+ years. There is no doubt in my mind he would have given anything to help that day. He is my hero. These are our heroes. Selfless acts of bravery and courage by countless men and women that day—not just at Ground Zero—are what I want to remember. To risk one’s life to protect that of many others when faced with death is the ultimate sacrifice. Never forget. Thanks Liz for sharing. I think it’s so good to reflect and never forget what happened.